I am very pleased to announce the relaunch of the newly redesign collinscenter.org website. The site has been redesigned to be more user-friendly and better organized. Click on the image to see it for yourself. Where Did the Billions Go? Find out how Florida has spent the Federal Stimulus funding. The Collins Center has revived the quarterly stimulus spending reports the state was posting before reducing the information it made public earlier this year. I am pleased to announce the launch of a new microsite I designed for the Collins Center that reports quarterly on the American Recovery Reinvestment Act and spending as it relates to Florida. The information was compiled by Don Winstead, formerly the special adviser to Gov. Charlie Crist for implementation of the Recovery Act in Florida. Click the image to view the site live. 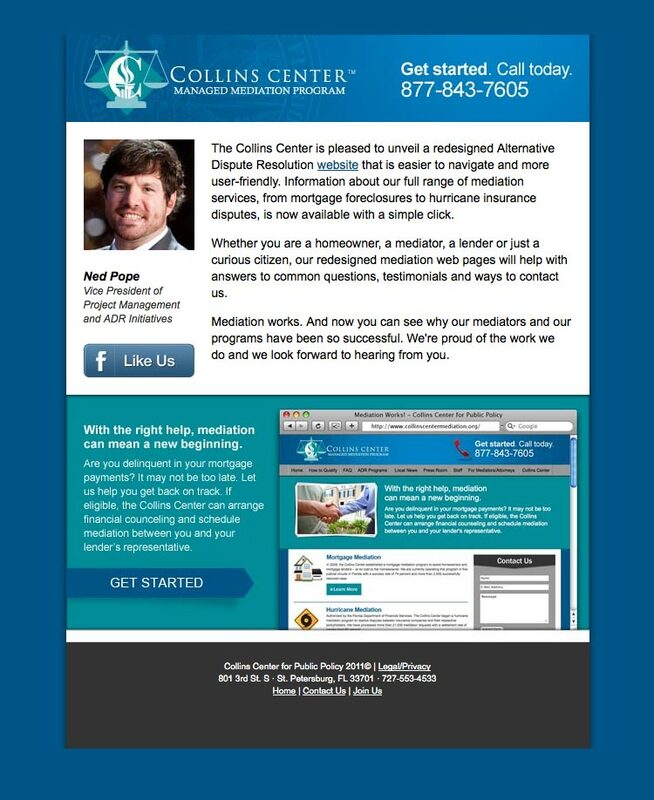 Here is a new email template I designed for the Collins Center’s Alternative Dispute Resolution Mediation program. It announces the launch of the new Web site I designed and created and matches the site’s branding. As always it is constructed using a combination of tables and DIVs and utilizes inline style to make it compatible with a broad range of email clients and browsers. It is designed to degrade gracefully when view with images off and has been tested cross-platform. Click the image to see it full-size. Announcing the launch of the redesigned Collins Center Mediation site. I redesigned this site from the ground up. Dressed in the Collins colors this site has it own unique brand identity while remaining part of the Collins brand. It features an interactive map on the Homeowner Mortgage Foreclosure page and a local news section for each of the twenty Florida Judicial Circuits. Click the image to see the site live. Announcing the launch of a new site I designed for Degrees of Success. Built in WordPress it features, unique images on header of each page populated with php. Click the image to see the site live. You are currently browsing the designspot blog archives for October, 2011.